New Orleans musical giant pays tribute to fellow Crescent City legend Louis Armstrong with star-studded, divinely-inspired new tribute disc. Special guests include Bonnie Raitt, The Blind Boys Of Alabama, Shemekia Copeland, Terence Blanchard and Dirty Dozen Brass Band. Rock and Roll Hall of Fame inductee and six-time GRAMMY®-winner Dr. John is New Orleans’ most prominent living musical icon. The embodiment of his hometown’s freewheeling creative spirit and multiple musical traditions, he’s built a visionary, idiosyncratic body of work that’s deeply rooted in the Crescent City’s myriad blues, R&B, jazz and rock ‘n’ roll traditions. So it’s fitting that Dr. John’s new album on Proper Records, “Ske-Dat-De-Dat The Spirit of Satch”, pays heartfelt tribute to another larger-than-life New Orleans legend: the seminal trumpeter and vocalist Louis “Satchmo” Armstrong, whose musical innovations created the template for 20th-century jazz, and whose playful attitude and life-embracing spirit made him a beloved figure whose worldwide appeal transcended music. Ske-Dat-De-Dat The Spirit of Satch honours Armstrong’s musical genius as well as his effervescent personality with 13 classic numbers drawn from various phases of Armstrong’s five-decade career, with Dr. John joined by a stellar supporting cast that manages to update the material while maintaining the music’s timeless emotional appeal. 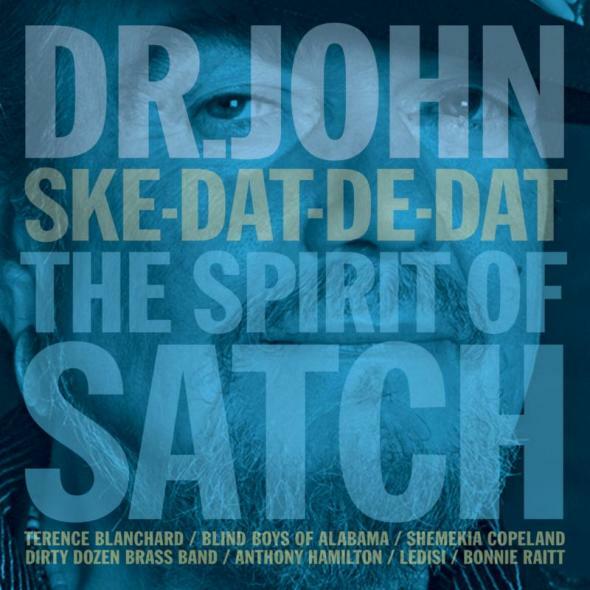 The subtitle The Spirit of Satch is particularly appropriate given the album’s birth cycle, which Dr. John says was set into motion when the late Armstrong—whom he’d only met once during his lifetime, in the office of their mutual manager Joe Glaser—came to him in a dream. Prior to making the album, Dr. John honoured Satchmo on stage, presenting rapturously received tribute concerts, dubbed “Props to Pops,” at New York’s Brooklyn Academy of Music in March 2012 and at the Hollywood Bowl in July 2013.